The ongoing growth of enterprise, residential and mobile multimedia services (such as peer-to-peer, IPTV and video-over-Internet) is producing unprecedented levels of traffic, stressing the bandwidth capabilities of metro and core transport networks. Consequently, carriers worldwide are actively seeking strategies to efficiently and cost-effectively scale IP packet transmission. Specifically intended to facilitate this transition, 100G/40G Ethernet technologies offer carriers the flexibility to phase in the implementation of these higher-speed rates to better align capacity increases with their specific growth and budget strategies. These new data rates are based on the IEEE 802.3ba standard. The most significant concept introduced in this new working standard is the use of parallel optics, which strongly influence the physical coding sublayer (PCS) implementation—one of the new building blocks for 100G/40G Ethernet. The key difference between the IEEE 802.3ba standard and its predecessor is the introduction of PCS lanes (formerly known as virtual lanes). PCS lanes provide an effective method of handling various parallel optical configurations and, therefore, demand a comprehensive solution that can easily test 4 x 25 Gbit/s, 4 x 10 Gbit/s and 10 x 10 Gbit/s configurations. Thorough PCS testing is among the critical layer 1/2/3/4 tests needed to ensure that 100G/40G Ethernet equipment and network services can be deployed rapidly and with confidence. Leveraging over a decade of FPGA experience, EXFO has integrated Ethernet (IEEE 802.3ba) and OTN (ITU-T G.709) functionalities into the same module, the IQS-85100G Packet Blazer. With this upgrade, you will be able to efficiently and costeffectively share the equipment in the lab: carry out early deployments. 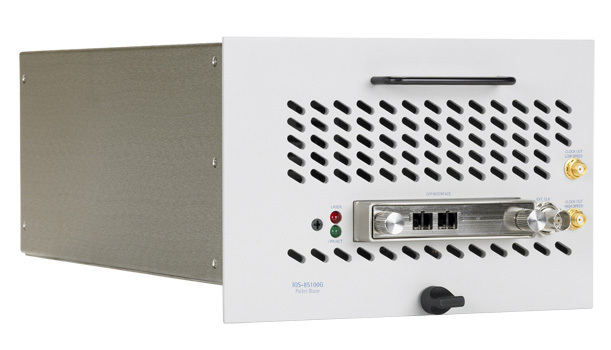 Purpose-built for applications where thorough testing, portability, true ruggedness and ease of use are required, this module offers powerful layer 1/2/3 Ethernet traffic generation and analysis, as well as RFC 2544 with Smart Loopback testing capabilities to stress and validate network elements and services against demanding corner cases.